Discover how pewter crafting became part of Kuala Lumpur’s history. create your own in 5 simple steps. we suggest the following attractions below. Shop for yummy tapioca crackers or get your portrait done. It is the first energy-efficient building in Kuala Lumpur. Batik painting with the kids is a top fun activity to do there. 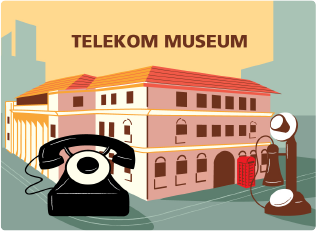 Trace Malaysia’s telecommunications development from past to present. There are interactive digital activities for kids at the museum. Late 19th century British expatriates in Malaya had to wait four months for news from home. 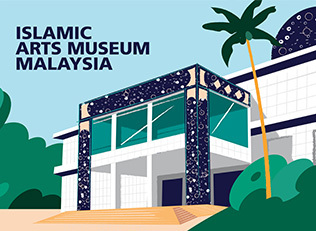 Immerse yourself in Islamic artistry and culture in Southeast Asia’s largest museum of Islamic art. You can indulge in craft activities with the kids at the children’s library. Royal Selangor’s Arabesque collection is a collaboration with the museum. 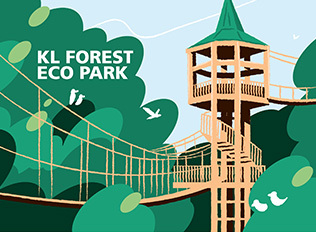 Enjoy breath-taking KL views and relax at the child-friendly KLCC park. The towers are the tallest matching pair of buildings in the world. When viewed from the top, the cross-section of the towers reflects the eight-pointed Islamic star. Treat your best buds to an exciting urban adventure! laugh over in your next weekend dinner. 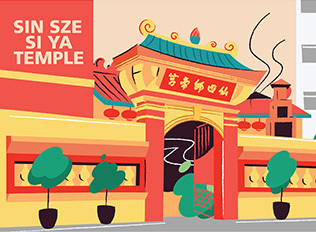 Snap gorgeous photos of traditional Chinese art and culture in KL’s oldest Taoist temple. The temple deities, Sin Sze Ya and Si Sze Ya once lived and worked in Kuala Lumpur. Rare altar pieces by Yong Koon, Royal Selangor’s founder are still in use today. Strike a pose in the vertigo-inducing Skybox, surrounded by the city’s skyline. 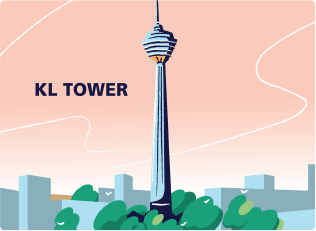 KL Tower is the tallest telecommunications tower in Southeast Asia. 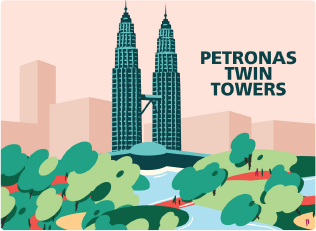 The tower is located next to Kuala Lumpur’s only natural rainforest. Start your selfie shooting spree at the KL City Gallery and end at Dataran Merdeka. 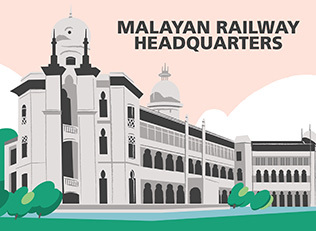 Look out for the Mughal-style Sultan Abdul Samad Building and mock-Tudor Royal Selangor Club. The KL City Gallery Spectacular City Model Show is the largest model of the city ever made. The Royal Selangor Club was dubbed ‘The Spotted Dog’, supposedly after the Colonial Police Commissioner’s wife’s Dalmatians. 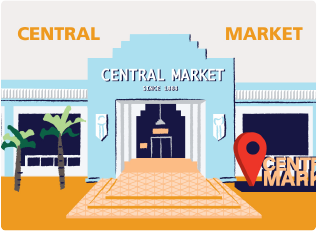 Eat your way across the city’s largest collection of roadside restaurants and street food vendors. Top eats include barbecued chicken wings and Hokkien Mee. For something exotic, try the Oc lap ha sa (strabismus snail cooked in lemon grass and ginger) from Saigon Station. Get your own magazine-style photo shoot by posing amid graceful arches and gardens of this beautiful colonial structure. Not one brick fell on the ground during its three-year construction. The building’s 40-metre high clock tower is dubbed the ‘Big Ben’ of Malaysia. There’s nothing like a gigantic golden statue and jewel hued steps to evoke a touch of the exotic. Lord Murugan’s golden statue is said to be the world’s tallest depiction of the Hindu deity. 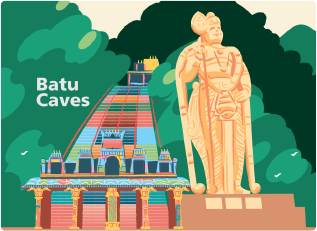 Batu Caves is also home to one of the world’s most unique statues — a five-legged bull. The building’s cupolas, turrets and thick walls inject an Arabian Nights feel into any holiday snap. The 5 domes on the roof were inspired by 14th century Greek design. The design of the building is partly inspired by the iconic Alhambra Palace. 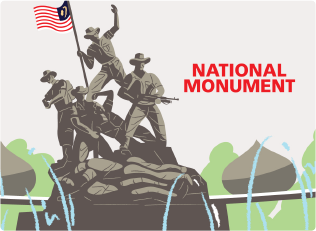 Learn about national heroes and spend a fun morning capturing picture-worthy moment. It is regarded as the world’s largest freestanding bronze sculpture. The 16 pewter water lilies on the reflecting pool is made by Royal Selangor. 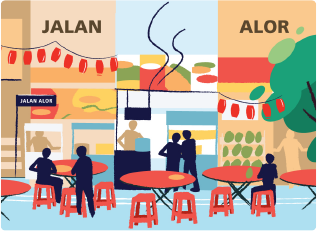 Discover the heart and soul of multi-cultural Kuala Lumpur! Indulge in ‘forest bathing’ by touring KL’s only remaining tropical forest. The park is home to a troupe of silvered leaf monkeys in the city. A local Malay chieftain once planted prickly pineapples here to deter his barefoot attackers. 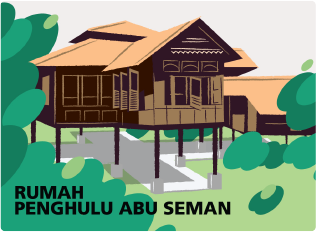 Glimpse traditional Malay culture and architecture in this unique award-winning local headman’s home. The house was built without any nails. The antique traditional Malay perahu (boat) on display was donated by Royal Selangor. Head towards KL City Gallery for a quick history update before walking through Dataran Merdeka. 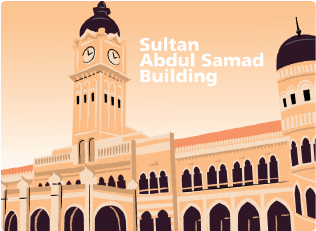 Keep an eye out for the Mughal-style Sultan Abdul Samad Building and mock-Tudor Royal Selangor Club. The Royal Selangor Club was dubbed ‘The Spotted Dog’, supposedly after the black and white Dalmatians which accompanied the wife of the Colonial Police Commissioner to the club. Discover gorgeous photo ops in the form of jewel-toned friezes and hand painted wall murals depicting Hindu myths there. The temple is said to be laid out in the form of a reclining human body. 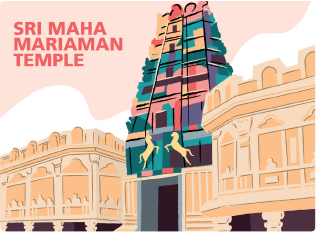 One of the best times to visit the temple is during Thaipusam. * The material and information contained on this post is for general information purposes only. 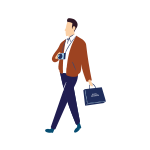 You should not rely upon the material or information on the post as a basis for making any travel, business, legal or any other decisions. Whilst we endeavour to keep the information up to date and correct, Royal Selangor makes no representations or warranties of any kind, express or implied about the completeness, accuracy, reliability, suitability or availability with respect to the post or the information, products, services or related graphics contained on the post for any purpose. 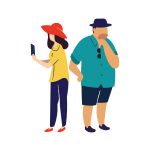 Be sure and check with the respective authorities regarding information on travel destinations, opening hours, availability, travel directions, and admission charges. Any reliance you place on the material or information on this post is therefore strictly at your own risk. Contact thecafe @ royalselangor.com or +603 4145 6186 for reservations. 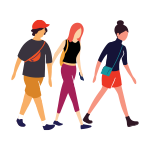 Plan your journey. 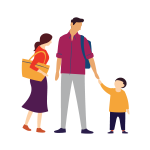 Click to visit MyRapid website. Find ample parking space outside the visitor centre. It’s free!